When I look at the majority of children and animals such as dogs, I see that they are free-spirited: their enjoyment of life has not yet been disciplined out of them. 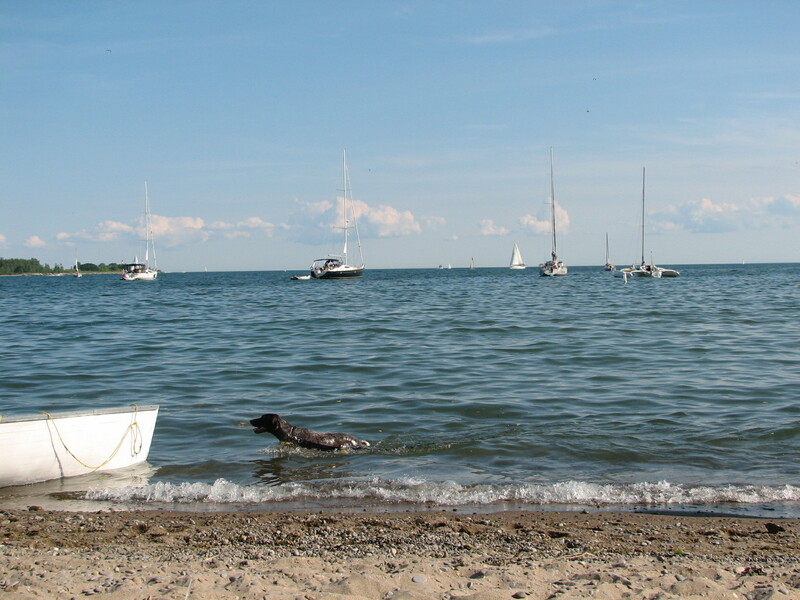 We were visiting the beaches on the Toronto Island and many people were out enjoying the sand, sun and water. The dog in the photo was no exception: he spent much time frolicking in the water, enjoying the refreshing coolness as well as the freedom of movement. What does the phrase “free-spirit” make you think of? The dog says it all. As for me, I remember my daughters. Young children are true free spirits, aren’t they? They express themselves so freely and have not yet learnt to hide their true selves from others. I love watching these animals at play and at work – they really go where they wish and do not seem to have a care in the world. Thank you. The setting also really adds to the enjoyment of watching the dog. Some dogs really love the water. Nice photo. The phrase ‘free spirit’ makes me want to clamber out of my ordinariness and be who I used to be – thank you Colline! It is very hard to be that person, isn’t it? With our responsibilities and expectations making us more serious. Sometimes we should take a leaf out of the book of children and animals and experience the moment with abandon. I love frolicking dogs on the beach! They do epitomise joy, don’t they? I just smile when I see it – just can’t help it. Dogs are wonderful since they really do show how happy and fun life can be. Happiness is this very moment…this very image. Beautiful my friend! Thank you – this photo has many pleasant memories of me and my family spending time together on the beach. To enjoy life is my answer. Great photo. Something we so often forget to do. Sometimes we need the boundless joy of animals to remind us. I would love to feel as playful and free spirited as that happy, happy dog in the photo. What a great pic to share with us and make us feel joy. Thank you Geni. The animals show us their boundless joy in life, don’t they? We can take a page out of their book that is for sure.